This is another card I did for this weekend’s VSN, JUN12VSNG– Journey of the Seas. The challenge was to use the song “Wreck of the Edmund Fitzgerald” as inspiration for your card. 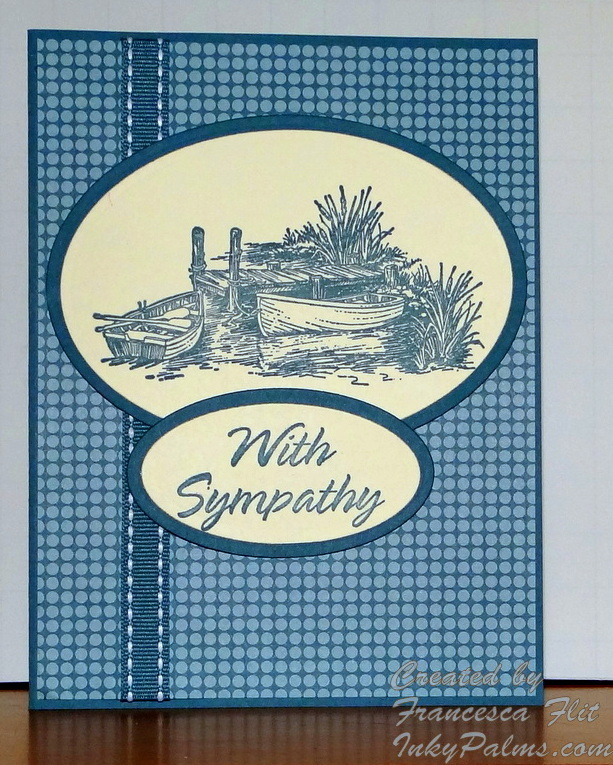 I chose to do a sympathy card in a single color, Stampin’ Up! Bayou Blue. I started with a Bayou Blue card base and added Stampin’ Up! ribbon and Designer Series Paper. I stamped the PSX Boats and Dock and Stampin’ Up! sentiment on Very Vanilla cardstock and used Nestabilities Ovals dies to cut the images and mats for another quick and easy card! This is the card I made for today’s Ways to Use It Challenge on Splitcoaststampers, WT376 It’s Not Easy…Being GREEN! Green is my favorite color and I use it quite often in my cards, so this was a fun one for me. I have to tell you, I have a love-hate relationship with bamboo! There is a large stand of bamboo in the yard behind our house and they make a gorgeous backdrop for our landscape, but sometimes they are loud. Between the birds chirping and the bamboo singing, there is quite the cacophony of sound in the early morning hours! The bamboo and birds were the inspiration for this card. I inked my stamp first in VersaMark, then in Kiwi Kiss and stamped. Then I embossed the image with clear embossing powder. While still warm, I dusted on Spring Green Pearl Ex, reheating different areas and applying more Pearl Ex to achieve desired effect. I cut the image and mat with Nestabilities dies and Stampin’ Up Old Olive and cream from The Paper Company. The patterned paper is from a mat stack, most likely a K & Company, but this was a loose piece. 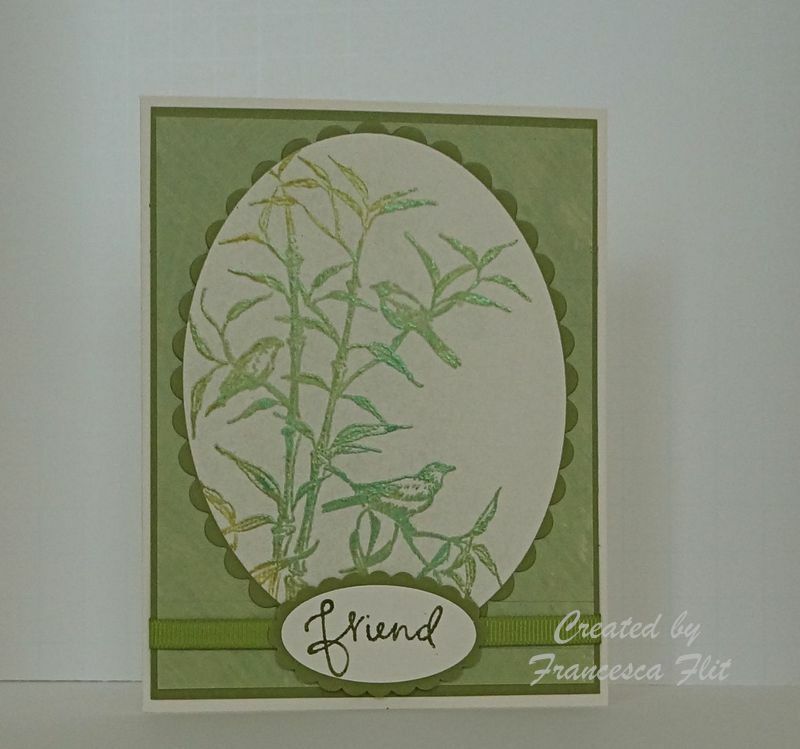 I stamped just the word friend from Stampin’ Up’s Great Friend, using an Old Olive Marker to color it. I used SU punches and Grosgrain ribbon for the sentiment and mounted the whole thing on the cream cardstock from The Paper Company.